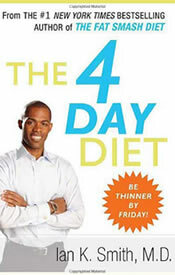 The 4 Day Diet was written by Dr. Ian Smith who is also the author of the Fat Smash and Extreme Fat Smash diets. Smith claims that this program will help dieters to avoid the common pitfalls of dieting including boredom, not allowing treats, too much repetition, and plateaus. The 4 Day Diet is not simply a diet that lasts for four days but rather it consists of seven separate dieting modules that last for four days each. Smith claims that it is much easier for you to focus on what you are eating for the next four days rather than what you will and will not be eating for several weeks. The purpose of the different modules is that of increasing variety in the meal plan so you don’t get bored eating the same foods all the time. In addition it has the benefit of keeping the metabolism working well because the body is kept guessing and it doesn’t have time to adapt to the diet. Dieters can follow the diet plan through the seven phases for a one month program but it is also possible to create a customized program where you start with the first two phases and then do the other five in which ever order you like. Smith places a great deal of emphasis on the psychological factors that are essential for successful dieting and says that losing weight is 80% mental and 20% physical. Dieters are provided with instructions on how to use tools like goal setting and visualization as well as with practical strategies for avoiding temptation. Fruit, vegetables, low fat dairy, lean protein, whole grains, legumes, nuts, avocado, low calorie salad dressing. The meal plans vary dramatically throughout the different segments. The following is a sample daily food list for the ‘Induction’ phase. 2 cups coffee. Limit sugar to one packet and cream or milk to one teaspoon per cup. 2 cups of raw or cooked green leafy vegetables. 1 cup freshly squeezed lemonade with no more than a tablespoon of sugar. 6 oz plain fat free yogurt. 2 cups green garden salad with 3 tablespoons fat free dressing. Each diet module comes with specific recommendations for exercise. Dieters are advised to build up slowly in accordance with their fitness levels and if necessary to break up exercise into several short periods over the day. The 4 Day Diet retails at $24.95. Unique and interesting approach to dieting. Good for dieters that get bored easily or don’t like to follow a strict diet plan. Addresses the psychological factors involved in weight management and dieting. Can be customized according to the dieter’s preferences. Highlights the importance of goal setting. Allows for controlled cheating, which may increase adherence to the diet over the long term. Does not require any special foods or supplements. The author has a very motivating writing style. Does not account for individual variations in calorie and nutritional requirements. The meal plan lists all the foods to be eaten in the day and does not break it down into individual meals. Will not appeal to dieters that prefer to follow a routine with their meal plans. Smith has provided dieters with a unique approach that may help to keep up interest and enthusiasm that will enhance the chance of successful weight loss. The ability to customize the diet as well as the differences between the diet segments will make this diet appealing to those who prefer variety or have difficulty sticking with standard diet plans. I just started the whole process today, the detox phase. I’m full now but have a feeling I will be hungry tonight, I’ll see how it goes. I’m excited to see how much wieght I lose, I have been drinking LOTS of water. 1st day- 5lbs gone, can hardly wait to weigh in tomorrow morning. my husband and I are on the smooth phase now. He’s lost 12 lbs in 1.5 weeks, i lost 8 in 1.5 weeks. This meal plan does not take into consideration calorie requirements so my poor husband struggles with hunger but i’ve been doing fine. I don’t even eat all the daily food recommendations. This seems to by more of a meal plan to re-introduce you to caveman eating. Its healthy, low-fat foods. We’re suppose to have more energy on these foods but there is no way i have anymore energy…by far the detox (first 4 days) were the hardest days on this diet but you DO lose quite a bit of weight on this! This does work if you stick to the food regime and exercise. do you following the diet for 4 striaght days or every other day to equal 4 days and what can i eat the other 3 days of the week? I would really like to get the book but i’m in South Africa, is it possible to get it here? just finished all the modules and i’m about to start them over – do you start from the induction module again? or do you skip induction and transition and go into the protein stretch? it’s my third day and i’m down two dress sizes i didn’t actually think it would work but it soo does. i recommend this diet to everyone! I looked over the meal plans and they don’t vary as much as they claim. Mostly a vegetarian plan. Tiny potions of lean meat or fish once a day after induction. Some low fat dairy allowed. Lots of veggies, fruit, and exercise. It allows some carbs like brown rice and beans or lentils. What do you mean, taking? Basically, you r following the plan as outlined in the book. 3 servings of fruit, large/med salad, 2 cups of cooked or raw green leafy vegetables, like greens, spinach, lettuce, etc., beans on day 1 & 3 and lots of water. For fruit, I chose strawberries, red grapefruit, apples and pears. i mean what are u taking on first 4 days ? Today is my 4th day on the diet and i’m down 5 pounds. I’ve not been hungry at all. I eat about every 2-3 hours. What I find that staves off hunger is to cut your fruit up in bite size pieces so that when you can eat them gradually. I’m on day 3 and I’m starving. I don’t know why because days 1 and 2 were great. I lost 5 pounds the first day! Any tips on how to stave off the hunger? what can u eat instead of eggs in this diet? I decided to try this diet. I actually started yesterday and I was not mentally prepared. I ate cookies and sweet tea. But I vowed that would be it. Last night I cooked my red beans and rice. Packed my lunch for today and I am ready. I sitting at my desk eating my beans and rice now. I am soo excited!!!! The diet solution is an ebook, you have to download it. If you check you’re confirmation email, you’ll find the links……. LOL you don’t drink 2 cups of coffee back to back. Skip the coffee anyway. Try green tea instead. Some of you are idiots! You don’t eat every single thing listed and you don’t drink 2 cups of coffee back to back (that was a gem). I substituted the coffee with decaf green (sometimes black) tea. I started the 4 day diet on March 5th and I had lost 6lbs by Monday, March 8th..Stick to the plan, it works. The detox is very important. @ Keyla, I do not eat pork so I did not put the ham hock in the soup and it was delicious. You only have to have 2 cups so I would suggest maybe a 1/2 of cabbage or a very small cabbage. This really works and I am so glad and excitied that I decided to try this diet!!! What is a subsitute for cabbage soup? me and my girlfriend and trying to start this diet out.The quetion were trying to figure out is how often do u it the stuff in each model?, and often during the day every hr or two hrs? You’re a nutritionist and you can’t spell or write a grammatically correct sentence — AND you’re hocking the so-called “Blood-Tye Diets” that have long been known to be a load of poo? I don’t believe you’re an educated nutritionist — not for one minute. Troll elsewhere. I like to use my juicer, does anyone know if this is suggested while on this diet I wonder if it is discouraged since you could combine much of the fruits or veggies into one drink. I am going to get the book today and i know i can do it. The first couple of days might be hard but i want to be swim suit’s this summer and i have to be in shape to keep up with my ten month old. But i don’t want to be one of those people stuck on diet pills. So this sounds perfect. Also my husbandy will be doing it to. I hope to see result’s and it stay off. Any advice? Would anyone who has the book be so kind and write the 7 modules of this diet…THANKS!! No, that would be a violation of copyright…. Most libraries have the book, if you don’t want to buy it. I went on this diet a year ago…lost 17 pounds in just over a month…I did the first month of modules and then another three modules…at that point I felt I had control of it and I have kept the weight off. I found myself craving salads with beans and rice (instead of things like icecream). He is right, just focus on the four days until you learn portion control. I needed a refresher and this diet (I prefer to think of it as healthy eating) did it for me. I have a bit of arthritis and found when I cut back on meat and focused on fruits and veggies and water (like he states in diet) that my joints didn’t ache as much. It is successful…on vacation I put on three pounds but that quickly disappeared again when I just “focused and remembered” what was good for me. I would now like to take off another 15 pounds and am going to go through it again. I have the book and intend to start the detox this week. My question is, do you go to the next module immediately or do you diet 4 days off 3, then go to next module? I kinda skipped some of the chapters and went straight to the diet plans…. Do I need to buy the book or can someone tell me what the diet meal menu is for the 4 days? I love this diet only on to day 4 but have lost 2kg going to buy the books. Never hungry love it. Recommend it to EVERYONE!! I drink green tea instead of coffee and space them out but you eat it how you want its up to you make it a meal or just a constint snack list, its great. Suzanne: I think that the 2 cups of coffee are distributed throughout the day i.e. you can’t have more than 2 cups. This is a great book to buy, since it allows you to prepare mentally as well as gives you a practical diet that does not take away the pleasure of food. I love this program. I have just completed the first four days and have already lost 5 pounds. I cheated a little and didn’t get all my exercise in because of things coming up. I know I could’ve lost more if I would have completed the other 2 days of exercise. I’ve been doing this 5 days and have lost a pound/day (I expect to slow down after day 8, after detox period). The 1st 4 days are restrictive: only fresh fruit, green leafy vegetables, brown rice, beans, legumes, plain yogurt, cabage soup, eggs. But you can have 2 c coffee everyday. I have not been hungry, because to eat all the servings he recommend, I try to eat once/hr. Day 5-8 introduces fish/chicken/turkey, diet soda and snacks. Day 9-12 includes sirloin, sandwich w hi grain bread, turkey bacon, protein shake. Days 13 on starts adding more variety of foods. I’m learning PORTION CONTROL and eating high fat/sugar foods as a treat or in strict moderation. Easy foods to find, eat, prepare — you need to think outside the box and plan your days to mix up the order of the foods he lists to suit your tastes and moods. I looked at the first day of module 1 (detox) and I wanted clarification. Do you drink the 2 cups of coffee back to back, or spread them out throughout the day? And do you eat the foods listed in order, or just find a way to fit them into the day? Please help. This is a really great diet, but it is very hard at first. In the “induction” module, you are basically eating four to five hundred calories a day. Dr. Ian describes it as a cleansing period. I think the rest of the modules are pretty manageable. I’m on Day 12 of the diet and I’ve lost 10 pounds and an inch off my waist. He recommends the amount of exercise you should do, and that is what I’ve been doing. Good luck! I love this diet. It’s easy to follow. I have seen great results. Buy the book it’s worth it. i want the complete diet chart of 4 days diet plan…….because it looks good to me. This is the greatest diet I every started, I have lost 6 pounds in 4 days, and went from a 37 inch waist to a 34.5 inch waist, by just following this diet, I even cheated a little and still lost weight, started at 220 and down to 214 lbs, get the book today and by next week you will be in a new pants size, no bull s! *t.